First appearance "George Washington Slept Here"
George Washington was the first president of the United States of America, a Founding Fathers of the United States, and one of the major driving forces behind the country gaining its independence. He served as the commander-in-chief of the Continental Army against the British Army in the American Revolutionary War, famously crossing the Delaware River to launch a surprise attack and gained a decisive advantage in the war with their victory. In The Super Mario Bros. Super Show! live-action segment "George Washington Slept Here", George Washington is first mentioned after Mario and Luigi set up a bed and breakfast in the Mario Brothers Plumbing. Mario intends to attract rich customers by advertising that George Washington slept there, despite that being a complete lie. George Washington then suddenly appears, admonishing them for lying while listing all of the places he has actually slept in. He is then invited by Mario and Luigi to sit at their table (with Luigi telling him he can take the cherries) while they run off. Mario and Luigi plot to hypnotize him into sleeping in their home, therefore making their advertisement the truth. The two tell George to lounge on their couch and he does so, not being one to refuse hospitality. Mario then pulls out a pocket watch and swings it in front of George's face while Luigi sings lullabies, but the two end up falling asleep themselves next to the still-awake George. He proceeds to break the fourth wall by complaining that he has to sit through a dream sequence; after saying this, the scene cuts to Mario and Luigi paddling in a boat on a river, with George ordering them to row to Valley Forge. He says that he is so desperate that he needs them to serve as replacements in his army. Despite their pleas, George ignores them, as he cannot forgive their lie, and he orders them to swim the last mile in the river. Mario and Luigi then wake up to find that both of them had the exact same dream about George, and that he was a figment of their imaginations the entire time. The Super Mario Bros. Super Show! also parodies George Washington through George Washingtoad, a Toad general who fights against King Koopa in the cartoon episode "The Koopas Are Coming! The Koopas Are Coming!" 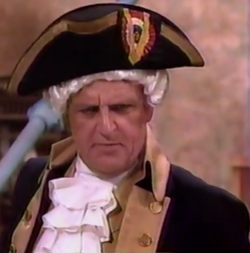 (the episode also parodies the Revolutionary War). This page was last edited on February 11, 2019, at 03:49.